These instructions describe how to set up a new VCS from a LANSA Repository. If you already have LANSA in a VCS, then go to 4.2.5 Setting up 2nd and Subsequent Developers to use a VCS Master for Git in the Cloud. All objects can be viewed in the one list. Easily see what objects have not been added to version control. Order all objects by Git status, Build status or any other attribute column. 2. Select all objects that you wish to add to version control. Tip: To select all objects in a list, click the first item, scroll down to the last item, hold down the Shift key and click on the last item. Alternatively, make the list a favorite by right clicking on the list and selecting Is Favorite. Go to the Favorites view, click on the list, click on an object in the list and press Ctrl-A. 3. 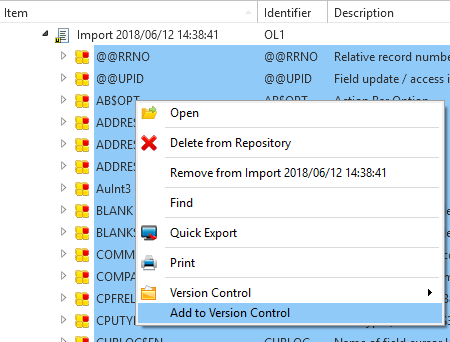 Right click on a selected object and click Add to Version Control. All selected objects will be saved into the VCS Working Folder. This can take quite a while for a large number of objects. Now you need to point the VCS at the LANSA VCS Working Folder. How you perform this step will depend on your Version Control System. The example used here is Git. The use of this as an example is not an endorsement that this particular VCS will suit your development and management style. You may perform this step from within the Development Environment or using a Git user interface program such as Git Extensions. To perform this step from within the Development Environment see Version Control – Git Integration in the User Guide. 1. Go to the LANSA Development Environment and on the VCS tab, right click on the Version Control folder and choose Show in Windows Explorer. Copy the whole of the path. 2. You must now initialize a Git repository in this directory. a. Open Git Extensions and on the first screen click Create New Repository. 3. You should see the Commit button on the toolbar with a tick in a red circle indicating there are changes to commit to Git. Click on Commit to show the Commit dialog. Stage all the changes and click Commit. LANSA and the VCS are now linked together.